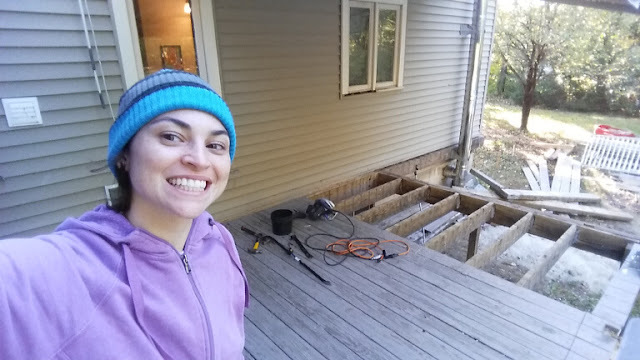 Well, I am happy to say, the demo of the old deck is complete, and as of right now, a whole lot of progress has been made, but we're still not finished. I can wholeheartedly say this is THE BIGGEST project I've ever undertaken. At this point, I'd consider myself crazy for thinking we could do this. Even crazier for the time frame I expected it to take. Once we ripped off the old ledgerboard, our fears were confirmed. The deck had allowed enough moisture buildup that it did some serious damage. 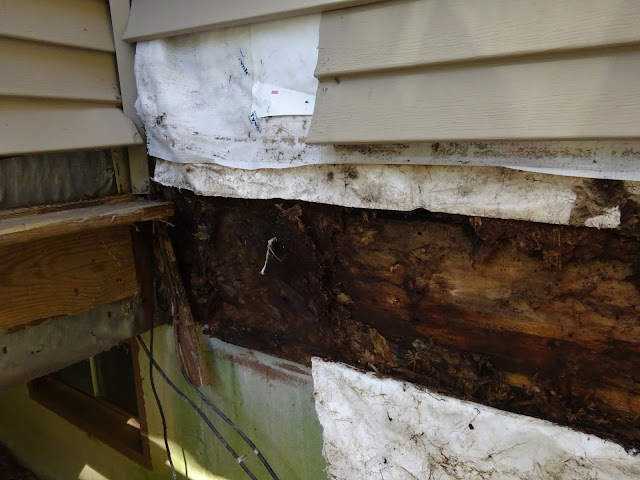 Moisture damage and a lack of flashing certainty isn't new to this house, but sadly this damage had gone through (disintegrated) the sheathing and started rotting out the rim joist of the house, and that is new to us. Either way, once the old deck was gone, we had two paths we could take to start the process of building the new deck - digging the footers or installing the ledger. 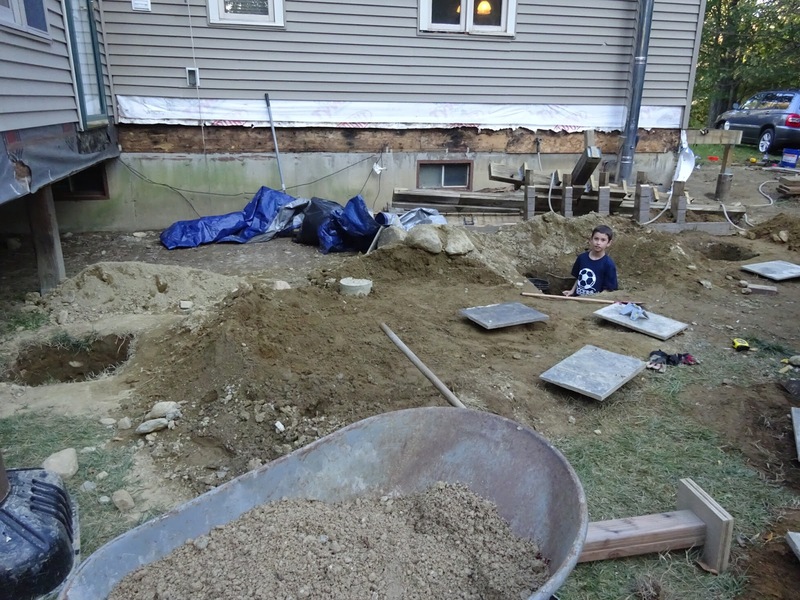 We decided to dig the footers, since we were worried the warm, dry October weather wouldn't hold on for long. 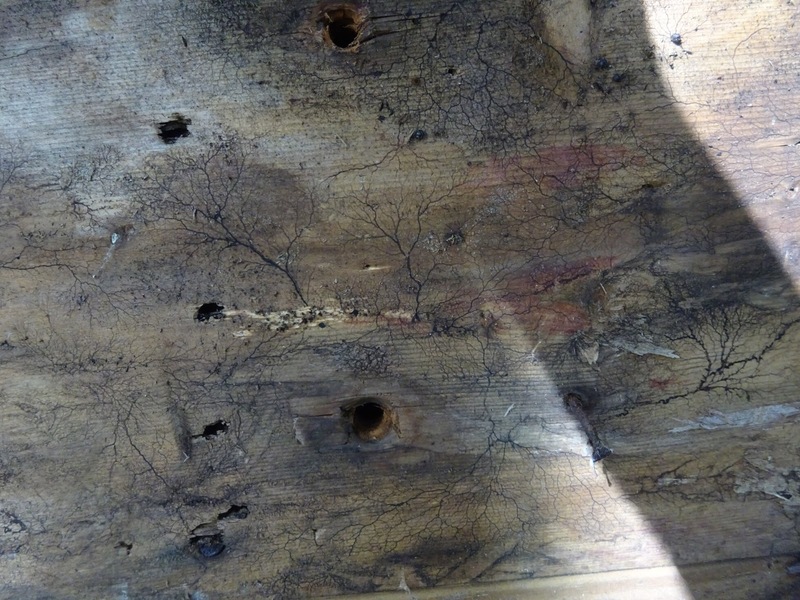 Plus the concrete would take a few days to cure. That, as we still didn't know what direction we should take for the ledger board. Replace it? Repair it? Harden it? Ignore it? We needed some time to think about it. 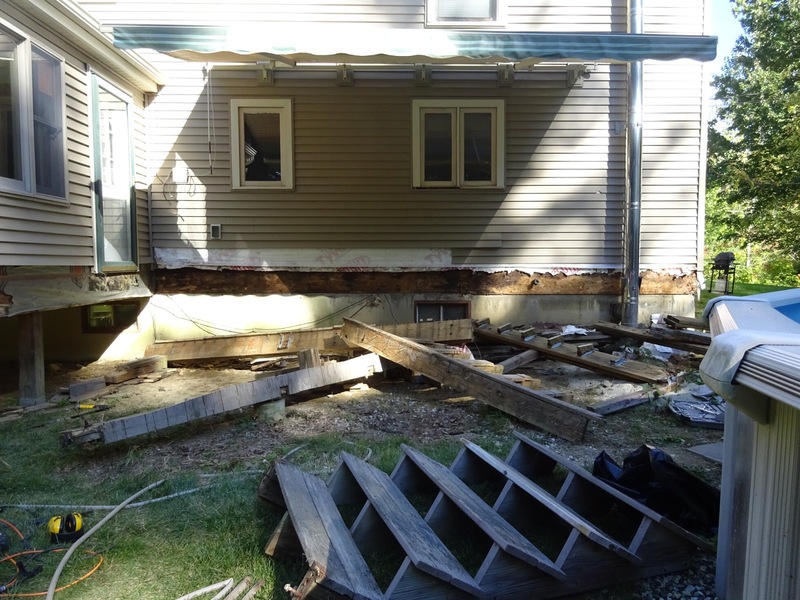 So the unfortunate part of our deck design is that it requires THIRTEEN footers. Yes. 13. It some regards it makes sense, as the project actually encompasses three separate decks. Focusing on the three deck mantra has helped me justify the overwhelming scale (and work) of this project. Surprisingly, 9 of those footers are fairly straightforward. Small and/or not very deep. 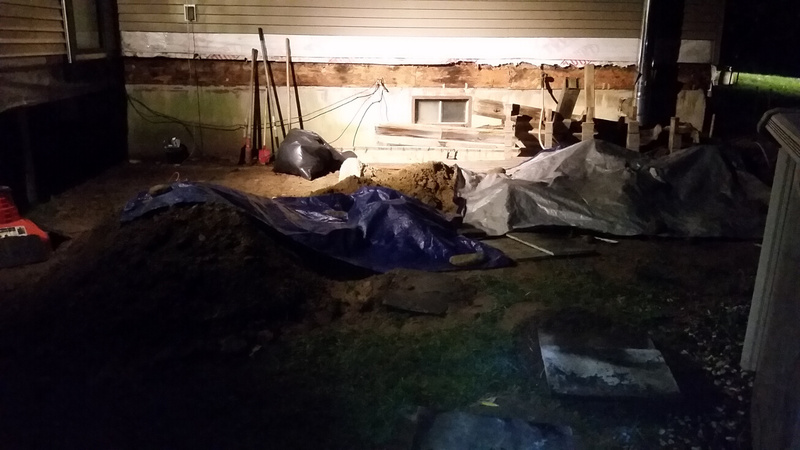 It was those last 4 footers that were where a ample amount of digging had to be done. 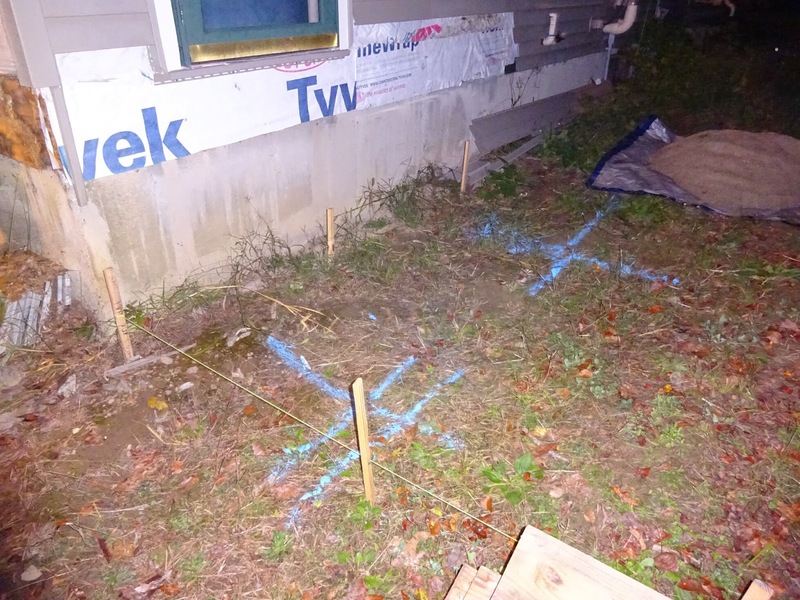 First things first, we marked out the footers and spray painted X's on the ground. I wised up after the first set of measurements and started marking them on the wall so we could measure square to the correct location. Even so, that meant 3 - 4 measurements each footer, about 45 different measurements, so that alone was a night's worth of work. The decision to rent the best auger we could was easy given the number of footers we had to dig. 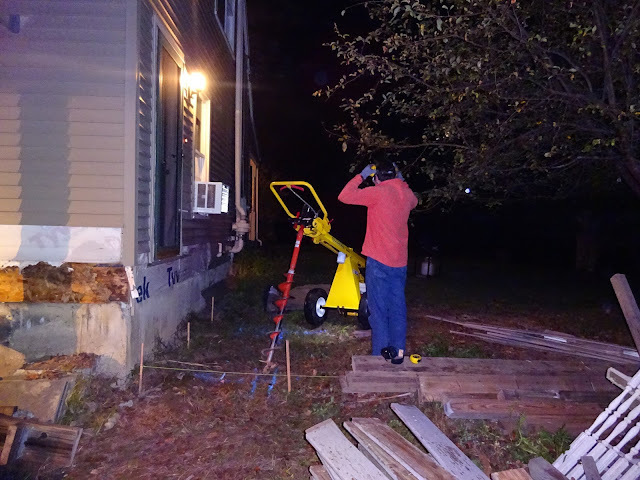 We went with least work intensive auger we could find, a towable auger from home depot... though it may have been easier than a 1 or 2-man auger, it turned out to be not easy at all. I'm a thin 5'3" and there is absolutely no way I could have done that myself. Almost all of the time Jon was at the helm, and the one time I tried it, I got it so stuck it took everything out of both of us to get it unstuck. Thank goodness Jon is a strong 6'3', because when it hit a rock, or even just needed to be held upright, it took a lot of strength to get it to do what you want it to do. 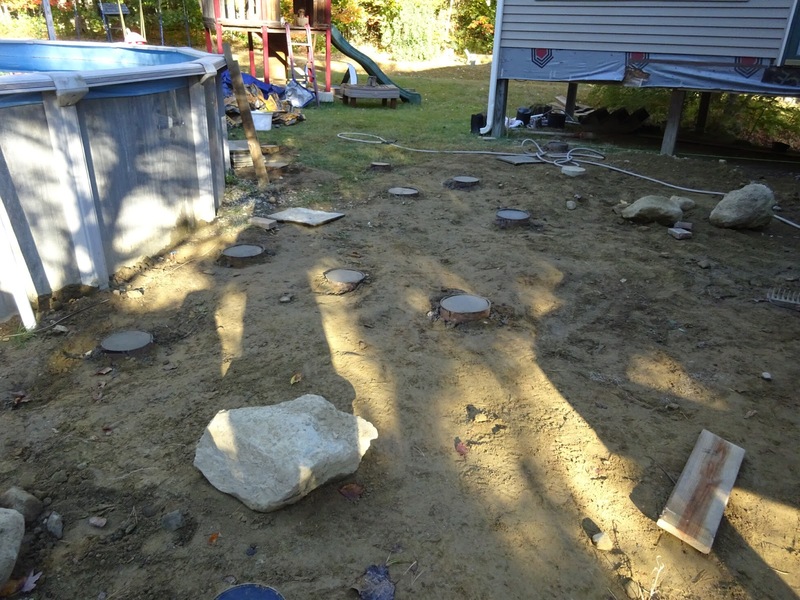 Despite the muscle power required, and the rocks, the auger worked well for the 9 straightforward holes. I hung around to help to use the handheld hole digger for the bottoms and fish out rocks while Jon rested. Oh, and I very proudly started the engine for him, as it was the first engine I've ever been able to successfully start! 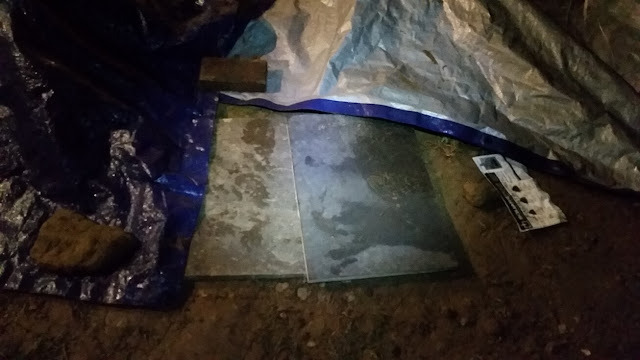 However, the four large footers would need to be a 22" square to get the squarefoot in . . . and the biggest auger we had was 16". Plus one of those four footers looked like it was over our well pipe, and one of those footers was a few inches under the sun room, so we weren't able to dig out very much but a shallow section of the middle of each of the four large footers. 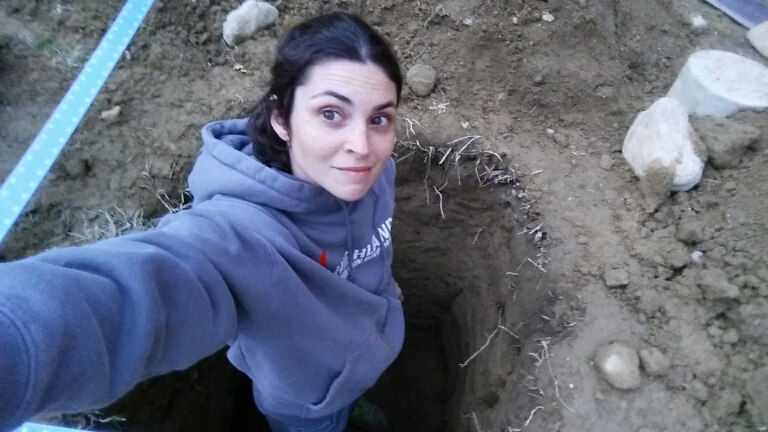 This was after a lot of hand digging. And that brings us to hand digging. A lot of hand digging. 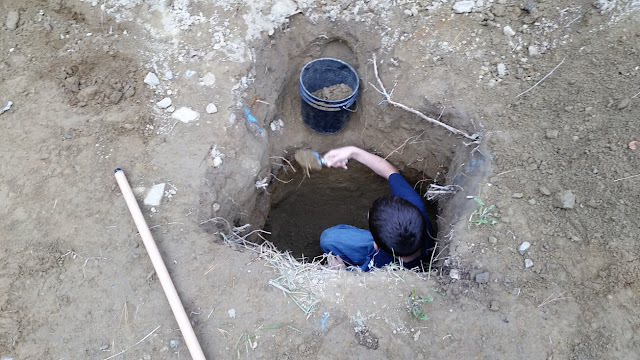 While I thought this would again be a task suited better for Jon, we found that I could more quickly remove dirt from the lower parts of the holes, as I was small enough to squat down into the hole, fill a bucket and bring it up. 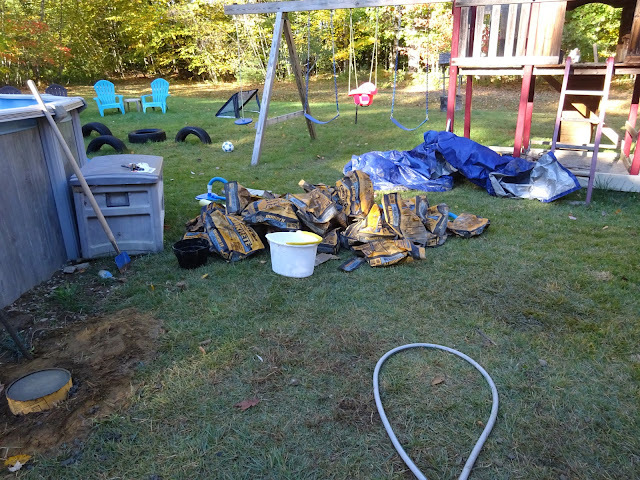 I used the long demo crowbar we bought to loosen the dirt and a hand trowel to put them in a bucket. One night, we were behind schedule a little bit, and conflicted about what to do when we saw rain in our forecast. 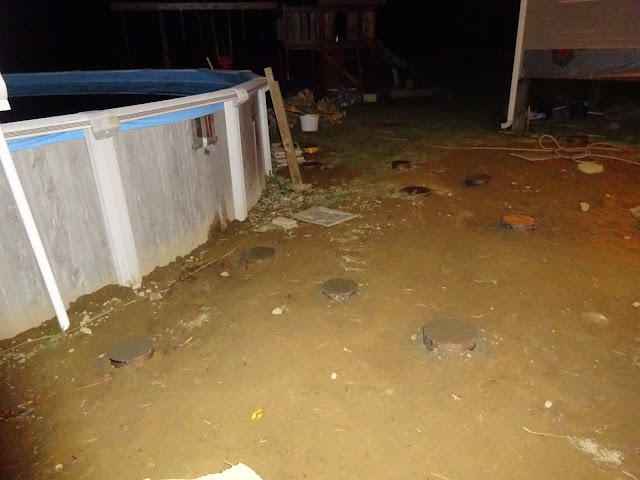 We really didn't want our holes to fill up with rain, but not all of them were dug to depth, and none were backfilled. 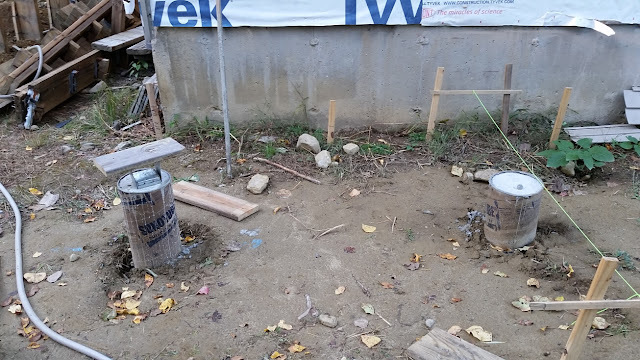 We decided the two kitchen posts we most at risk of collapse from rain, as they were long and narrow, so we decided to pour the concrete for just those two footers. We rented a small mixer from Home Depot, hauled some 60lb bags of concrete in our SUV and filled them up. We used an inverted squarefoot on top of the footer as a funnel and it made loading it so much easier. 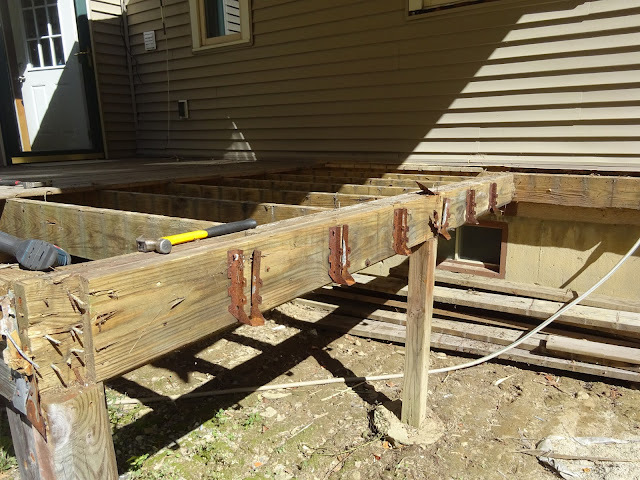 I used J bolts for those footers, and had a little bit of a hard time getting them located correctly, despite being an easy measurement. In the end they turned out well and I was happy to get a small scale run of what pouring footers would be like. For the other holes, we decided to cover them up with tarps and leftover flagstone extracted from our walkway project. That worked very well to keep the holes from filling up with a lot of rain, allowing us to continue to dig even just hours after a big rainstorm. Despite the fact that digging that spanned a full week, with me and Jon digging several hours just about every day, I sort of enjoyed the process. 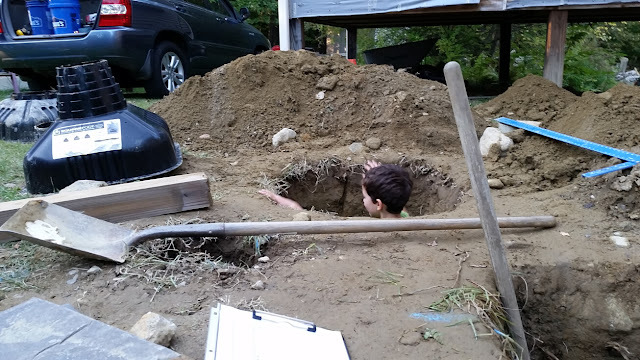 We had just read the book "Holes" to our kids the previous month, the weather was warm even at night, and my kids enjoyed jumping in and out of the holes along side me. Plus my muscles were filling out nicely, and my core strengthened quite a bit. Honestly, the worst part was the fear that a snake was going to fall in a dark hole at night with me. 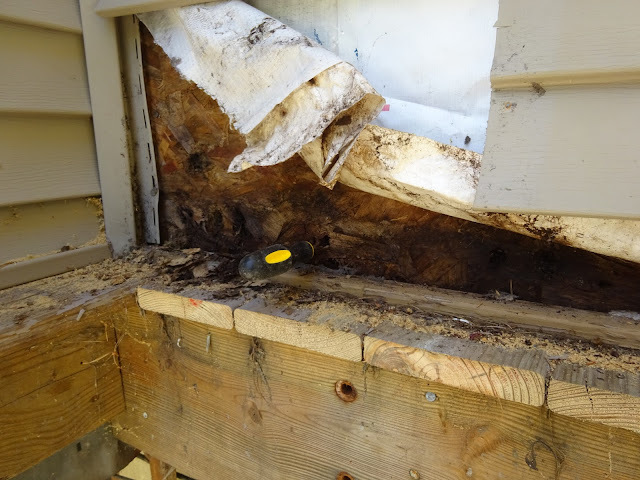 Instead, we did have a few mice drown in the holes, which was sad, but I was happy that a snake didn't find them first and I didn't have to recreate an Indiana Jones nightmare. Oh, and the dirt EVERYWHERE. 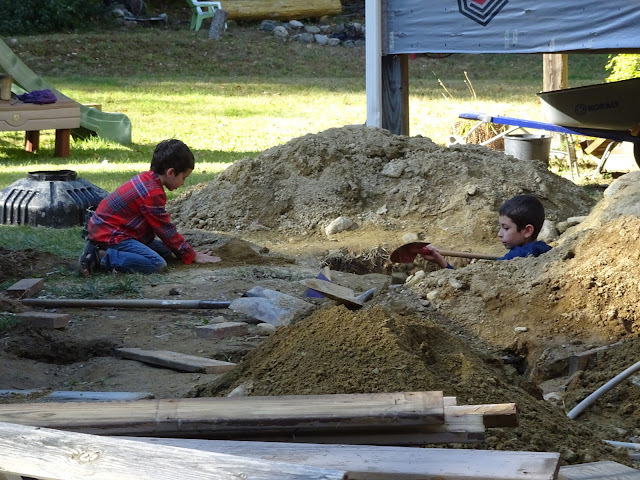 Our house was uncharacteristically dirty for a few weeks thanks to this project. 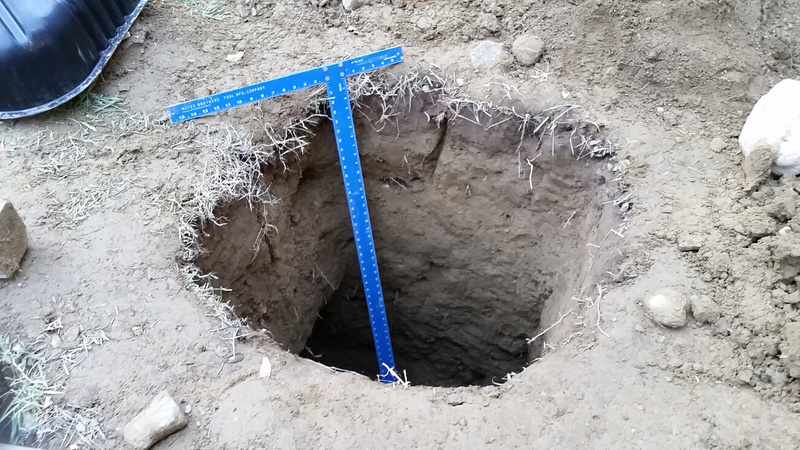 We did have to adjust the location of the holes a little bit, after we checked the measurements somewhat far into the digging. It seemed that the auger had a bit of a pull and missed the mark. I am so glad that after the first round of 45 measurements, I ordered a laser measurement tool from Amazon. We hung a plumbbob off the back and between the two of us, were able to more accurately mark out the hole locations. It was still time consuming, but much less than it could have been, which is good, because we had to mark the locations for the center of the footers (and later, bolts) three to four times. I'm estimating about 120 more measurements, and that sure adds up. Success is an empty chamber in the ground. 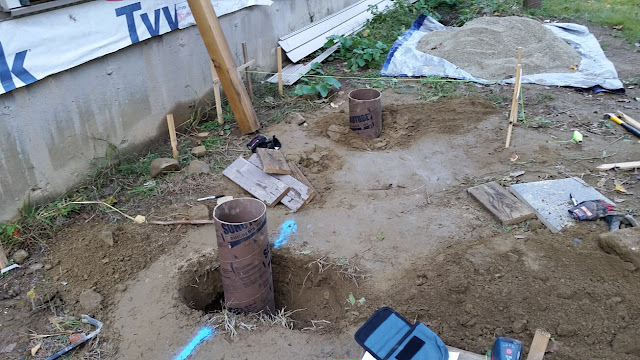 Once the holes were dug to depth and centered, we packed some leftover hardpack from our walkway into the bottom of the hole, leveled the footers, and set the sonotubes on top of that, leveling them with a post level. Sounds a lot easier than it was. 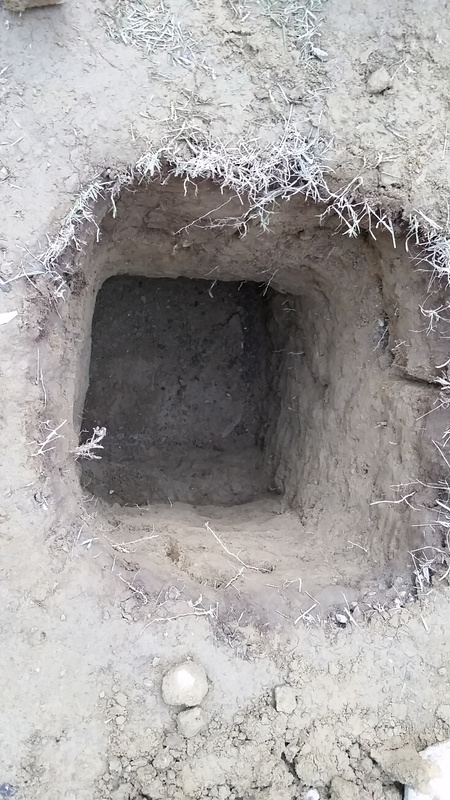 It is such a relief and a bit emotionally draining back-fill the big holes. 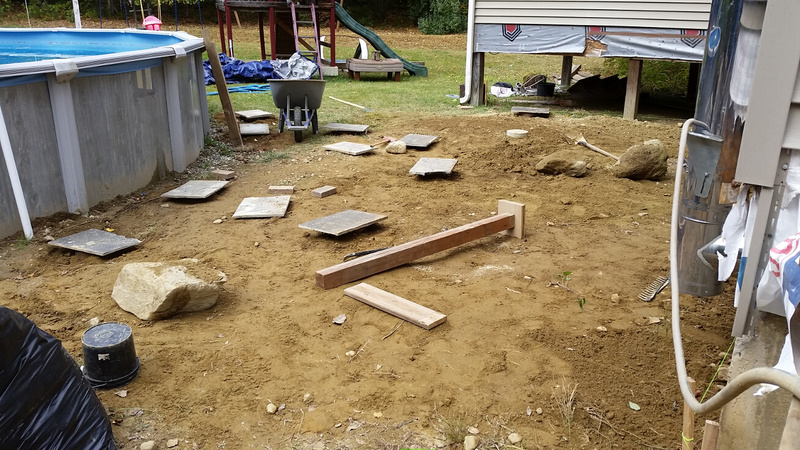 We were so happy to have the footers set in place, but part of me was so sad to put back so much of the dirt I just spent all week pulling out! Alas, I knew the goal and got over it quickly. 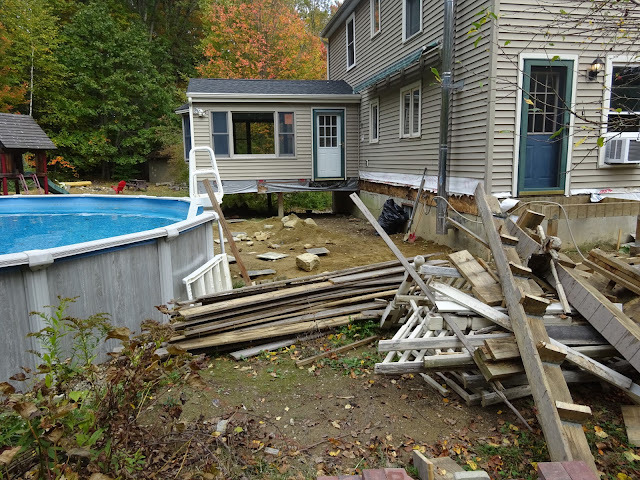 Somewhere in there, after backfilling most of the holes, I moved the rest of the old deck off to the side. 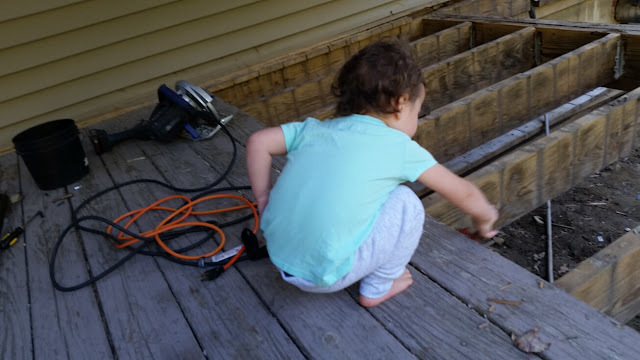 We bought a reciprocating saw, and I used it for the first time cutting the old deck into [mostly] manageable pieces for me to move. 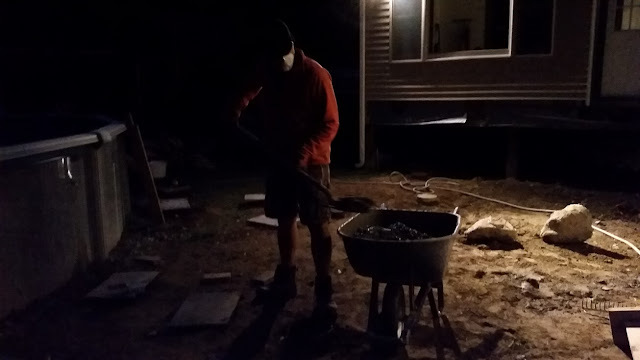 I actually stayed up pretty late as I was so excited to move the wood, pick up the trash, and rake out the dirt. It was like spring fall cleaning! 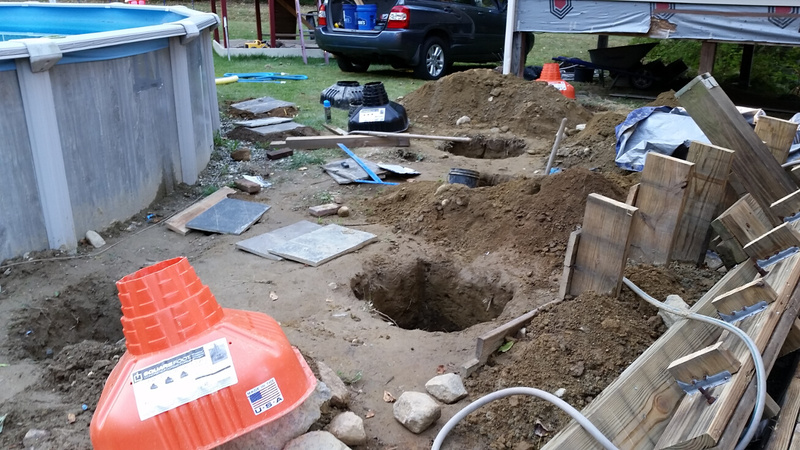 Under each stone is a sonotube, waiting for cement! And that wraps up the hard part. Kidding! Pouring concrete is no easy feat, so I really tried to strategize how to make it easiest on our bodies. Jon has hurt his back mid project before, and I'd rather pay money to rent tools than to a doctor. 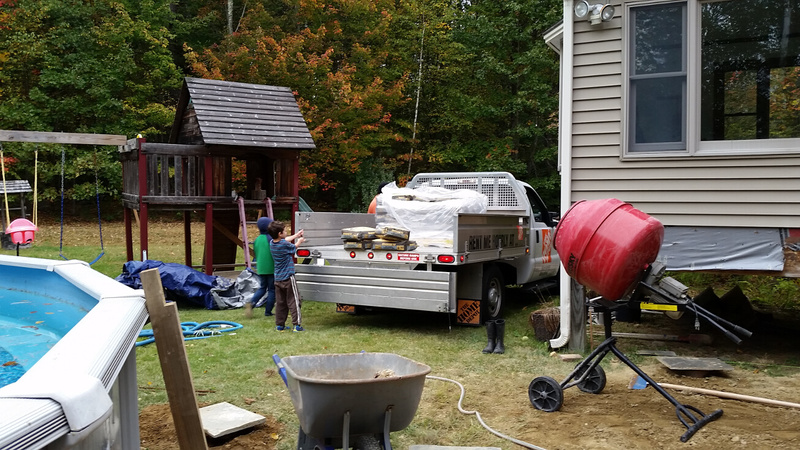 Unfortunately, having a concrete truck deliver seemed like it would end up being more work. 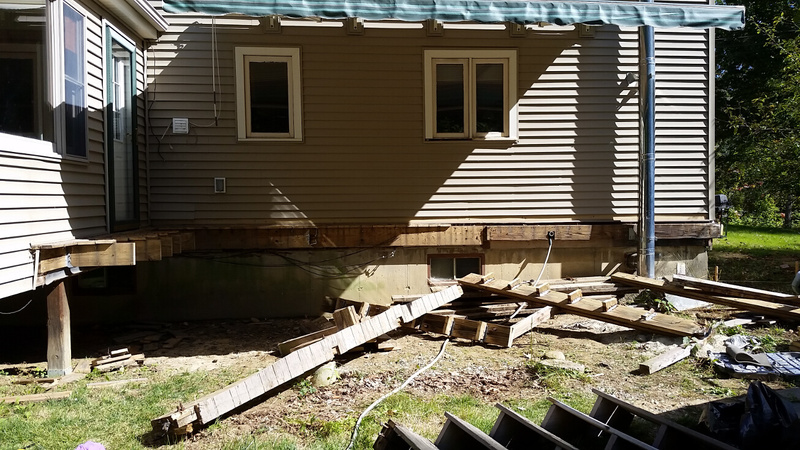 The deck side of the house is up a hill, and the local delivery can only pour in the driveway (or at the street) into a wheelbarrow. Which would mean a lot of running heavy wheelbarrows up a hill. 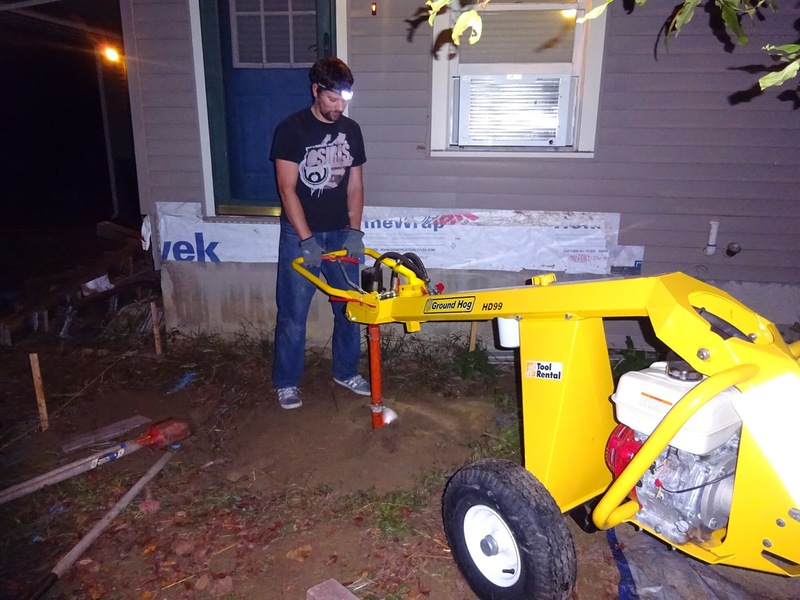 The second easiest option was one we tried out on the two kitchen footers. Drive the concrete in the SUV to the location we need, and pour them into the mixer right out of the SUV. We only move the concrete bags twice, and then only move them a few feet in a wheelbarrow to the footer after mixing. It seemed reasonable enough, and I was convinced we would get it down to only moving the bags once. 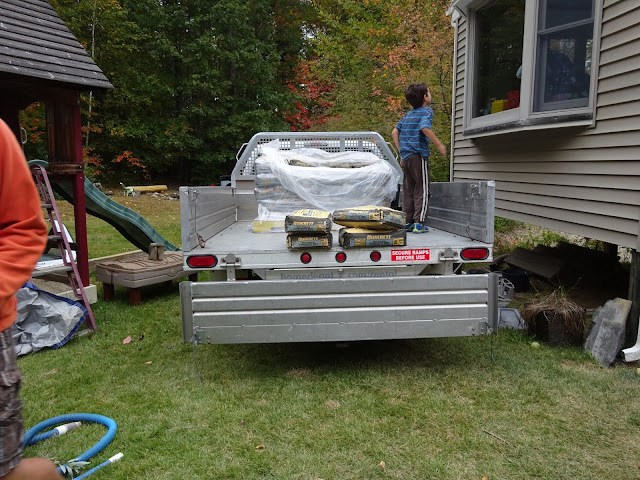 So rented a Home Depot pickup truck, and had them use a fork lift to directly place our concrete order into their truck. Worked great, and they were happy to do it! We only moved each bag once. We actually didn't need to rent a mixer that time, as my parents, odd enough, bought one off Craigslist that week for their front walkway. It gets dark realllly quickly this time of year. For most of the time, Jon would load concrete into the mixer and mix it up. He'd dump the load in the wheelbarrow (it's a lot easier to do if the mixer's on when you dump it! ), and wheel it over next to the footer. 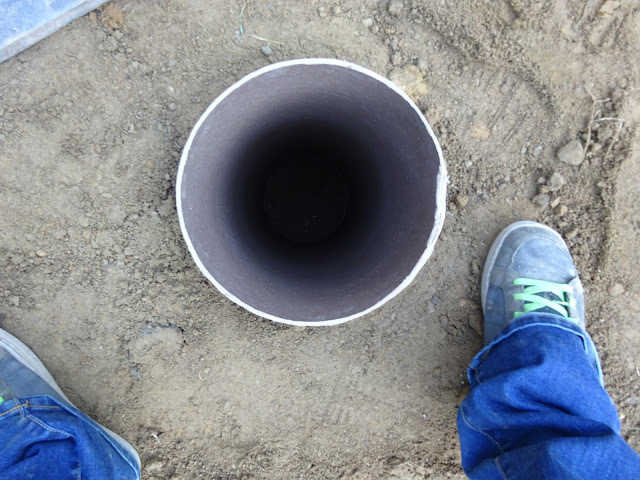 I would shovel the concrete into the hole, use a pole to wiggle the air bubbles out, place some rebar and smooth them over. I was kicking myself the whole time for not buying another squarefoot to pour into like a funnel. There was good potential we could have skipped the wheelbarrow step altogether if we had a big funnel to pour the mixer into. We decided not to place j bolts in each of the footers at this time. We figured it would be too much time with the truck (at $20 an hour) and we wouldn't be able to get an accurate enough location, quickly enough for all 11 footers. Retrospectively, I think we made the right decision. 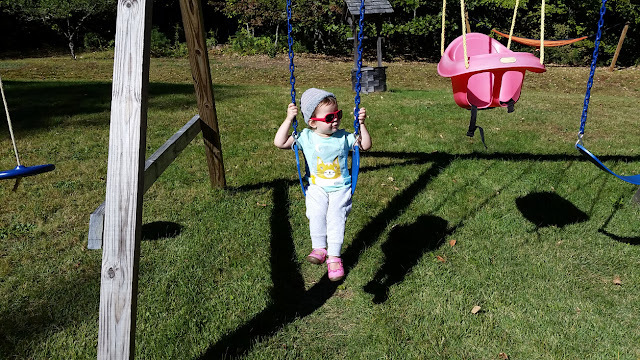 Thankfully, my Mom was over to watch the kids while we worked, so I helped Jon drive the truck back to Home Depot, pick up our SUV and have a quick date at 5 Guys as a reward. 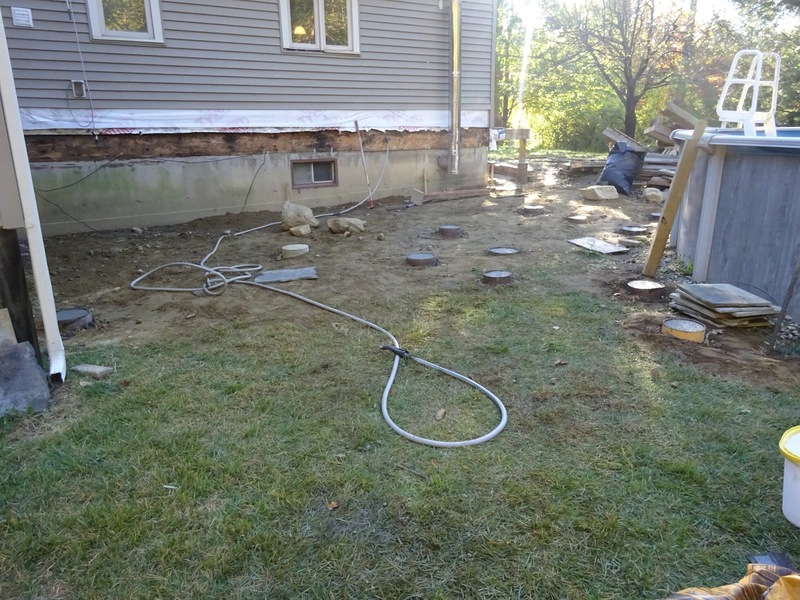 That wraps up the demo and pouring footers section! 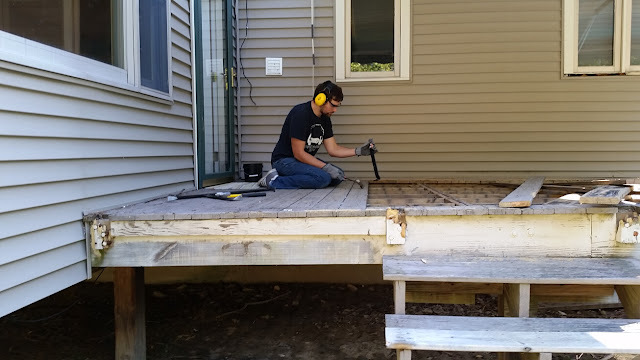 Up to this point costs are pretty low for such a large portion of the deck building process done. 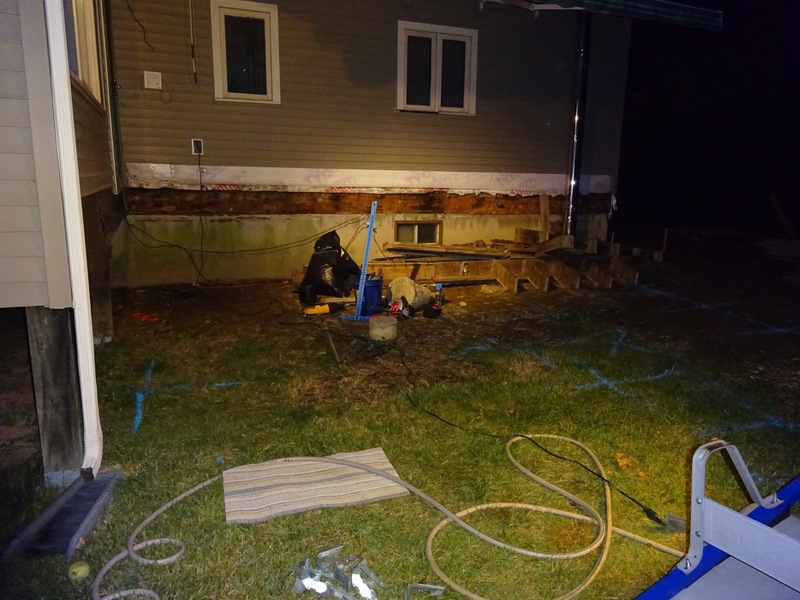 Total we spent $534 on rentals and materials, and $242 for tools, bringing the total to $776.10 for demoing the deck and pouring footers. Not too shabby if you ask me. It was $500 for just a cuyd of concrete delivered, so I think we did well. 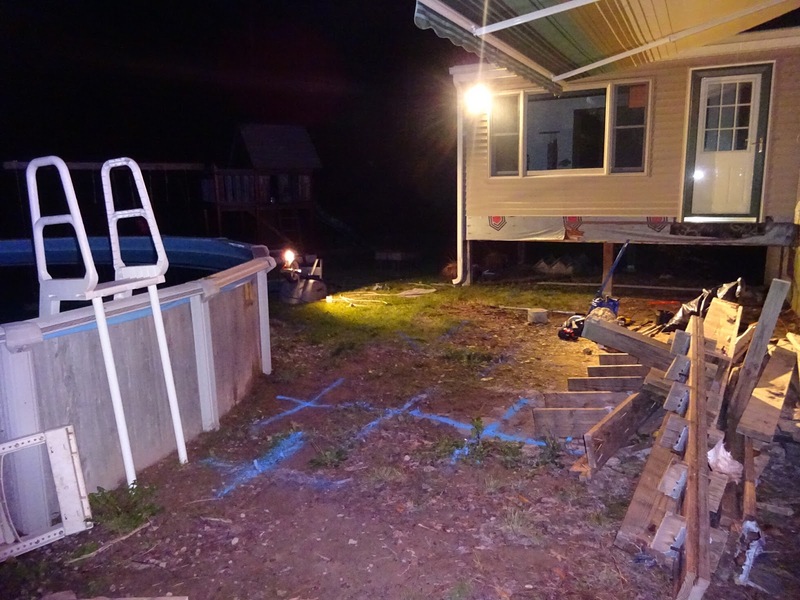 The teardown spanned 12 days, but technically, only took two, as we only worked the first and last day of that span. It was also 12 days from the teardown to pouring all the footers, and I'd say that's pretty good!